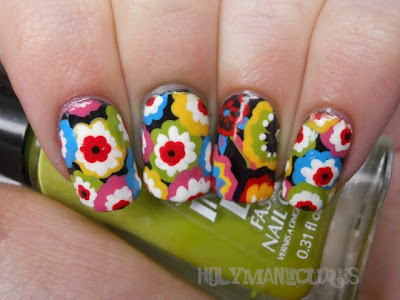 Holy Manicures: Symphony in Hue Nails. 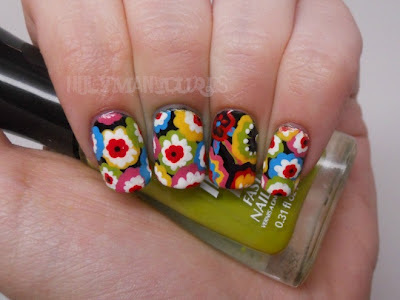 In June I posted this manicure, inspired by a Vera Bradley pattern on my favorite post-it notes. After that post I had a few requests to do manicures for some of the other Vera Bradley patterns. 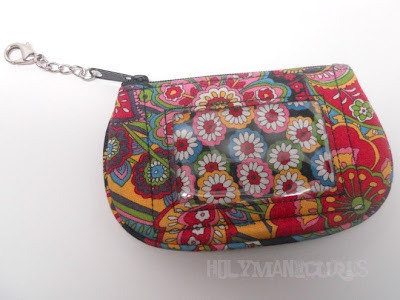 I decided to go for it since I don't care to carry any of my Vera Bradley items anymore, but the patterns are still perfect for being worn on my nails. This time I took my inspiration from this ID case in the Symphony in Hue pattern. This design was the biggest pain to clean up, the blue polish was especially bad since it stains. I'll have to remember that for next time. The polishes I used were Wet n Wild Black Creme, CND Bicycle Yellow, Sally Hansen Presto Pink, Sally Hansen Brisk Blue, and Sally Hansen Lickety-Split Lime. The rest of the colors are acrylic paints. I know it's been a while since you've doen this - any suggestions for someone to try it? Born Pretty Silver Glitter Review. Born Pretty Fimo Slice Wheel Review. Born Pretty Half Pearls Wheel Review. Sally Hansen Magnetic Nail Color Review.